Mata to United rumors are in full swing. If reports are to be believed the negotiations between Chelsea and United representatives have begun in order to lure Mata away from Stamford Bridge. Mata is definitely not going to be happy at SB with very little game time and getting to play in games involving lesser opponents. Surely he would be looking for more first team football afterall it’s the World Cup year and his place in the Spain XI is in jeopardy. He has to prove a point, a point he is not able to prove at Chelsea under Jose. A GREAT deal for United. United get one of the best CAM in the world for a premium yes, but quality is never cheap and in today’s inflated market, it’s a steal. Knowing what Mata can do on the pitch, i say he is worth it. United gets the better deal with respect to player and cash in the long run. Jose is a massive Rooney fanboy and he will be looking to get something on Rooney in return. A transfer in January is out of question although this will be Jose’s first demand. If not he would be looking for an option in the summer. Meaning Mata to United in January, Rooney to join Chelsea in June. This to me is the most likely scenario. Since United are struggling for top 4, United would want to keep Rooney and add Mata in the squad to add quality. Once that goal is achieved or not, even then Chelsea can have Rooney who will have just one year left on his contract and a move to Chelsea will earn United handsome cash as well. Win Win? This is highly unlikely considering Rooney’s importance to United to get the 4th spot. It leaves united back to square one selling one classy player for another. Net effect is Zero. The option i would favour. He will obviously go there for lesser value but still better than pulling off a Wenger by selling your best player from last 2 years to a rival club. We can can tempt PSG to sell Cavani, another unlikely move but better than selling Mata off to a rival. Fact of the matter is Mata is as good as gone, if not in January then in June. But who is the better suitors in all this fiasco? Mata move to United is not a logical one either. United with Mata and Rooney in the XI in a 4-4-1-1 system leaves United playing Mata on the wings. not his best position. Mata on the wings leaves United with defensive problems as well for an already weak backline you surely don’t deploy wingers who are lazy off the ball. Unitted will have to change the system altogether which i don’t think can happen. It’s just not the ManUtd way. It’s annoying really but it’s best for Mata to move a move to a non rival club i.e. PSG or if someone from Spain calls. 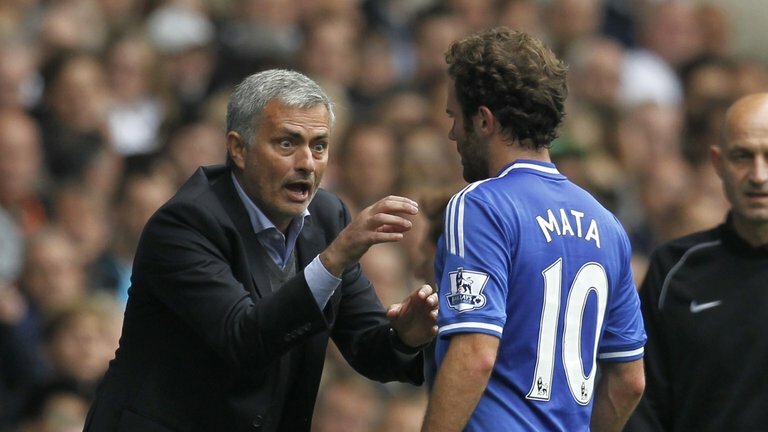 Some tough decisions to be made, but wherever Juan goes, i hope the Chelsea fans will let him know that he DID MATA. To sum it up .. Chelsea NEED Rooney, United WANT Mata. Lets see who wins on the negotiation table. Shouldn't Juan Mata be allowed to go now? We don’t want Rooney and we can’t sell Mata to Utd,if Mou doesn’t want mata anymore we should sell him to a foreign club not Epl.But I really do pity this guy,he doesn’t deserve the kind of harsh treatment he’s receiving from Mou! I don’t understand your suggestions.This is what. Causes trouble at Chelsea.Not fair.We should be encouraging mou to give/demand more playing time for Mata! !.He is ours,ours!.We still need him.Give him more playing time,He is good,the whole world knows it. The worse nightmare is to sell Mata to United. I can’t imagine this realistically better we offer him free to Valencia than to sell him to United our rivals. We made an error in the past by selling Sturridge to Liverpool so hope am proven wrong the least am expecting is to sell him to our rivals. Mourinho be wise don’t sell him to our rivals. loan him to atletico madrid,not selling him he is a good player its just that mou hates spaniards,look what he did to spain no.1 casillas. And replaced him with who. Better be quiet if you don’t know what to say. For the fact he doesn’t play mata doesn’t make him hate spanish players, case in point azpilicueta. So Cesar Azpilicueta and F Torres ar nt Spaniard? Or wot do u mean? Another one with bs arguments. If Casillas is so good why the first choice for the league is STILL Lopez? Iker is a good keeper, overrated though, with several limitations and a great press support, as is Ramos who has less concentration that Luiz and that’s saying a lot. If Jose hates spaniards, how did Xabi and Alvaro Arbeloa (this last one always received critics of the “specialized press” for not being a Cafu) always played regularly with him? Why Azpi and Torres are enjoying regular first team football, aren’t they spanish? I’m starting to get tired of this “debate”, with all this noise around him, I’m sadly beggining to want to Juan leave Chelsea fast (and not because of him). At least, the Juan Mata FC supporters will presumably disappear… even another “killed” career will appear sooner than later… KTBFFH!!! This rumour is funny, mou refused 2 sel ba to arsenal cos he considers them a title rival nw u are talkin of selin a player of mata’s quality 2 another rival? Nw that makes mou utterly stupid and it doesn’t make sense at al. I agree with you 100%. If Mata had shown himself in the few opportunities he had, some critics would have an argument. What some seem to forget is that Juan performance’s this year have been very weak (some say he lacks “continuity”, but Andre or Willian lacked that too and when they enter the field they are ready to fight). I cannot understand the argument that Jose is trying to “kil” Juan’s career, it doesn’t make any sense to me. With all that, I’m getting a bit tired of that noise around Juan, and starting to want him to leave sooner than later. Listene mourhino knows what he is doing,,mata was great where he could do his own thing on the field,,now it’s different,if we want to win the league again,,I say trust the special one,,I do 100%..end of this is Chelsea football club…..
if jose knows he wil sell mata dis january,why not sell him last summer when cfc wouldve easily made 50million.now his value has gone down.even direct swap wit rooney isnt a good busines bcos mata is 25 & rooney is 29.look @ roben & sturidge,de question is when wil chelsea learn their lesson?we lost roben & got malouda,but whil roben is doin wel even til now,malouda hav disapearif jose knows he wil sell mata dis january,why not sell him last summer when cfc wouldve easily made 50million.now his value has gone down.even direct swap wit rooney isnt a good busines bcos mata is 25 & rooney is 29.look @ roben & sturidge,de question is when wil chelsea learn their lesson?we lost roben & got malouda,but whil roben is doin wel even til now,malouda hav disapearif jose knows he wil sell mata dis january,why not sell him last summer when cfc wouldve easily made 50million.now his value has gone down.even direct swap wit rooney isnt a good busines bcos mata is 25 & rooney is 29.look @ roben & sturidge,de question is when wil chelsea learn their lesson?we lost roben & got malouda,but whil roben is doin wel even til now,malouda hav disapearif jose knows he wil sell mata dis january,why not sell him last summer when cfc wouldve easily made 50million.now his value has gone down.even direct swap wit rooney isnt a good busines bcos mata is 25 & rooney is 29.look @ roben & sturidge,de question is when wil chelsea learn their lesson?we lost roben & got malouda,but whil roben is doin wel even til now,malouda hav disapeard. My friend we dont hav 2 sel english rivals bt enay other major legue.